Completing our introductions of Don Giovanni's three lady friends, today we speak with Jacqueline Bezek, who sings the role of Zerlina. A Guest Artist who has joined the group for this production, Bezek tells us about her backstory with our stage director (who was profiled in today's Seattle Times), the challenges of singing Mozart, and an unusual scene she performs in this production of Don Giovanni. You studied voice at UCLA; is that where you first met Peter Kazaras, who’s UCLA's Director of Opera when he isn’t in Seattle? I was fortunate enough to meet Peter Kazaras at UCLA where he was directing our production of Gianni Schicchi. That was one of the most creative, hilarious, well-directed shows I've ever been in. I have been a huge fan of Mr. Kazaras' work ever since. He has a very special way of translating a phrase, a situation, a personality trait into a modern-day equivalent that performers can really relate to. It has been such a treat working with him again here in Seattle. What are your other Mozart roles? Despina in Così fan tutte was my very first role! It's funny because Despina and Zerlina have a lot of similar characteristics, so I've enjoyed tapping back into that sassy personality. The past few years I've avoided singing Mozart - I decided "I'm just not a Mozart singer," but in reality, that was just an excuse because his music is tough! Learning Don Giovanni has really given me a new motivation to sing more Mozart - it's hard, but it's great music, and very healthy for the voice. I'm hoping in the future to maybe sing Donna Elvira - talk about challenging! 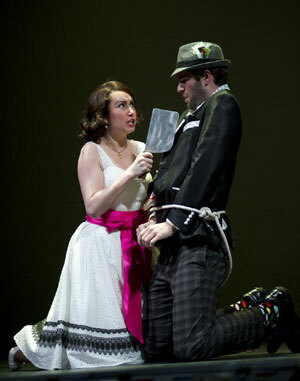 David Krohn (Don Giovanni) and Jacqueline Bezek (Zerlina) in the YAP production of Don Giovanni. What advice would you give Zerlina, if you knew her in real life? Is she well-matched with Masetto, or might she enjoy a fling with Giovanni? What happens to her after the events of the opera? If I were Zerlina's real-life friend I would've seen right through Giovanni's allure and advised her against any sort of fling with him. But, for a peasant girl, I can see the draw - Giovanni really buttered her up. It seems she needed that experience to really appreciate what she has with Masetto. In the end, I think she learned they are best suited for each other, but, knowing Zerlina - no regrets! Occasionally you find mezzos singing this role. As a higher soprano, how does the role of Zerlina fit your voice? Do you sing Zerlina’s arias for auditions? This role has been a challenge, but it has given me the opportunity to work on my middle voice. A lot of Zerlina's music lies in the passaggio, so working through that has been tough. I have had to keep reminding myself to really sing into the lower notes and stay grounded, or else it's easy to go sharp. I've never sung either aria in an audition, but moving forward, it might be a good opportunity to show that, while I have a high voice, my middle voice DOES exist! 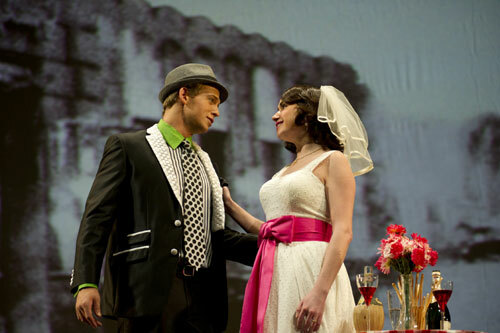 Jacqueline Bezek (Zerlina) and Erik Anstine (Leporello) in the YAP production of Don Giovanni. You and Erik Anstine as Leporello are singing the often-cut duet, “Per queste tue manine.” Tell us a little about learning and staging this piece and what it’s doing in the opera. Zerlina loves being in control. We see her manipulate Masetto, but her feisty character certainly manifests itself in this duet with Leporello. The music gets kind of nutty, and we've staged it in a way that truly reflects Zerlina's lunatic state of mind. She comes out with a huge cleaver and tells Leporello she is going to shave him without soap! At first I don't think Leporello takes her seriously, but throughout the duet he becomes increasingly scared as she becomes increasingly crazy (sometimes I think Erik is really getting scared - I look like a psycho!). The Zerlina in this production is a little more thick-skinned than others I've seen, and performing this duet really gives me the opportunity to exemplify her domineering nature.